Interested in studying Business in German? You will be able to select from a wide range of classes in the field of Business Administration, Economics and Business Law, such as Finance and Controlling, Human Resources, Project and Information Management, Marketing, Global Markets, and Statistics. All classes have an international emphasis and relate to today’s globally operating markets. They follow an applied approach to learning by always connecting with the real business world of companies which are permanently affected by changing cultural, economic and political impacts. In addition to gaining more knowledge in different Business fields, you can also improve your communication and intercultural skills in order to be fully prepared for your future career. You are an enrolled Business student at a partner university of HTW Berlin. You will have covered at least two semesters in a Business/Economics study programme prior to enrolment at our university. A good level of English (proven C1 level) is compulsory. General Courses (at least 4 ECTS), e.g. other training courses (for example related to intercultural skills) or courses of general interest. 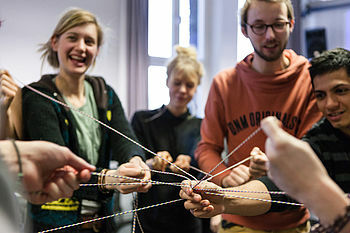 Intensive German and Orientation Programme (before your first semester starts). Information about the courses offered by the German degree programm Business Administration could be found under Studying in German/Business Administration. Wednesday and Fridays NO PERSONAL OFFICE HOURS only via email, Phone, Skype from 10:00-14:00 (or with appointment at a different time).